Open call for projects and papers to be presented in the QUAM 2011 Forum. ACVic Centre d'Arts Contemporànies. Within the Framework of the Project QUAM 2011, ACVIC Centre d’Arts Contemporànies launches an open call for projects to be presented as part of the forum that will take place on the 8th and 9th of July, 2011. One contemporary experience that has clearly caused great changes in the social, political and cultural contexts is the practice of building tools and computer technologies based on open source. A mechanism based on the sharing of results and processes, where the achievements of a group or an individual are also starting points for others. A succession of connected elements mixing creativity, skills and material production, built and consumed through a shared experience. One element allowing the generation of content, based on collective experience, is the wiki. A wiki is a website which allows creating and editing any number of web pages connected to each other, sharing a common language and allowing access to a control group. 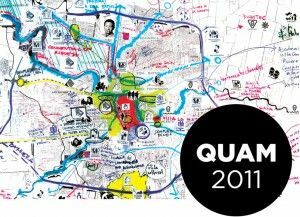 From this perspective, the construction of tools, tactics and collective practices applied in the context of the city, will be the subject to be discussed in the forum and project workshops in this edition of Quam 2011. Wikpolis translates the possibility of meeting and proposing projects focusing on this option of the node to the context of space and the policies that regulate it, providing with the opportunity to create new shared strategies for modifying social and cultural context. - Cartographies and political representations of the space, to represent or influence policies regarding the use of space. References to works revealing latent conflicts in rural and urban space and generate maps that help to interpret them. - Collective creation in the social space, referring to self managed social processes which use mapping tools to enable collective strategies, building a network and seek alternative systems for citizens. Can the city be designed and built from the logic of shared creativity and open source? Who may participate? How to organize a joint project? How can existing practices be mapped in an area? Self-sufficiency, co-responsibility, alternative practices ... what relationships could we establish with the administration? How can you build new cultural practices? Could these transform the social space? Can alternatives to current economic models be generated from the perspective of applied creativity? The aim of this open call for projects is to detect existing works, in progress or already finished, proceeding from different disciplines such as artistic practice, architecture, design, activism and social practice that that respond to the two themes proposed in this edition of QUAM. The selected projects will participate in the Forum together with a list of invited professionals. The deadline for sending projects is the 17th of June, 2011. Participants should fill in the application form [closed]. Six projects will be selected to participate in the Forum. The direction team of the QUAM 2011 Forum and two of the invited participants will be in charge of the selection of projects. - Detailed description of the project and graphic documentation. ACVic wil provide accommodation and per diem for the two days of the Forum (July 8 and 9). The participants will receive an accreditation issued by the UVic Universitat de Vic certifying their participation as speakers of the Forum. Selected participants will take part to the QUAM 2011 publication. ACVIC may use all the images of the projects for purposes of dissemination and publications. QUAM 2011 Forum direction: Maral Mikirditsian (independent curator), Ramon Parramon (artist and director of ACVic), Laia Solé (artist and professor at UVic). David Juàrez-Straddle 3, in collaboration with Santiago Cirugeda – Diego Peris of Todo por la Praxis, Sergio Moreno of Hackitectura. The workshop counts on the participation of La Torratxa, Centre Cultural Autogestionat. 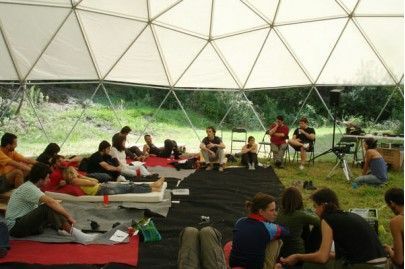 QUAM 2011 is an ACVic Centre d'Arts Contemporànies activity, organized within the framework of UVic. Universitat d’Estiu de Vic in collaboration with: H. Associació per a les Arts Contemporànies, Escola d’Art i Superior de Disseny de Vic, IMPEVIC Institut Municipal de Promoció i Economia de Vic, Escola La Sínia, Elisava. Escola Superior de Disseny, MACBA and La Torratxa. Centre Social Autogestionat. ACVic, Centre d’Arts Contemporanies is the outcome of the collaboration between Ajuntament de Vic, Departament de Cultura i Mitjans de Comunicació of the Generalitat de Catalunya and H. Associació per a les Arts Contemporànies.